Ile de Ré and Algarve... Curious comparison, and yet the two regions present some similarities which give them the status of amazing family holidays destinations. Both fascinating, they are home of wonderful landscapes and awesome beaches allowing to practise many activities. However, while the traditional French region has a mild and enjoyable climate, the trendy Portuguese region benefits from a warm one; the first one is ideal for relaxing holidays in perfect harmony with nature and local traditions, while the second one will please traveler looking for a warm and festive atmosphere. All you have to do, is to choose which of these destinations is right for you! Golden sand or salt marshes? Both regions present amazing landscapes, often sheltered by National parks and Nature Reserves. In Île de Ré, the Nature Reserve of Lilleau des Niges is not to be missed. Over 120 hectares of nature and salt marshes, home to many species of migratory birds, mainly from the Nordic countries are to discover. You also have the Asinerie du Baudet of Poitou, where donkeys, mules and horses are all reunited, allowing childrens, notably, to enjoy this visit as they can touch the animals and see the natural living environment. Ideal for a family get away! In Algarve, Natural Park of Ria Formosa, like the Nature Reserve in Ile de Ré, constitutes a marshy park as well. More than 60 km of wonderful landscapes and fascinating fauna and flora await for you. Probably one of the best occasion to discover the wildest part of Algarve. Besides that, The Serra de Monchique is a fascinating natural area in which to venture. It is simply the border between the northern Algarve and the rest of Portugal. Hikers and nature lovers will fall for this place. The landscapes boast magnificent chestnuts, eucalyptus, with a touch of color by the flowery mimosas. Finally, at the top of Picota, you can contemplate a magical view overlooking the region. Although both regions are home to beautiful natural areas, they both owe their reputation to their sublime beaches, where there are two very different atmospheres. On Île de Ré, the beaches are long stretches of sand for miles. No matter where you are in the area, you can be sure that the beach will never be far away. These are very well preserved and are known for their endless foreshore, rocky or muddy, which is unveiled at low tide and offers exceptional walking. Each beach presents face and different atmosphere. For family outings, the beaches in the area are ideal. If you want to bathe and let the children bathe in total safety, Les Gollandières, Gros Jonac beach, Dolphins and Little Ragot, are ideal. Thanks to the mild and humid climate of the Ile de Ré, it is not harmless to find trees such as pines and tamarinds on Les Folies and Prises beaches. The beach of Les Trousses Chemise also faces a forest, bearing the same name. In short, on Ile de Ré, it is common to find salt marshes, forests, and fine sand together in the same place. Shades of green, blue and golden sand await you. As for the Algarve, it is a drier climate that we find on these beaches mainly composed of golden sand and turquoise waters. It is a camaieu of warmer colors that you will find in the region of southern Portugal. While the beaches of the Ile de Ré are large expanses of sand on a flat relief, those of the Algarve are embellished with impressive rocks and caves accessible by boat. 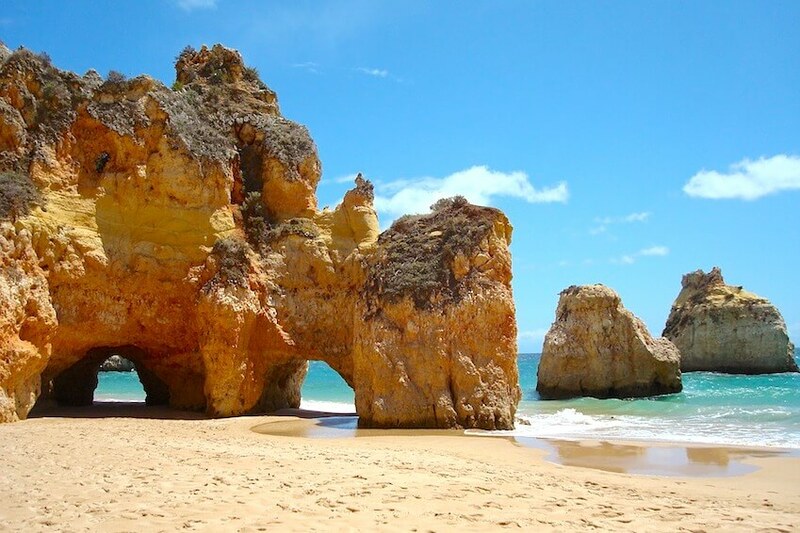 The Marinha beach or Ponte da Piedade, for example, in Lagoa, finds its place in the ranking of the 100 most beautiful beaches of the world thanks to its natural beauty where one finds impressive cliffs and natural tunnels. Like the French region, each beach has its own face. In search of a calm and soothing atmosphere, on the Beach of the island of Armona you do not risk being disturbed as it is large; if you are looking for a more lively atmosphere, Praia de Vale do Lobo and Praia de Rocha have restaurants and bars but also facilities such as casinos and discotheques. Thus, as we have seen, the two regions present a wide diversity of beaches and natural areas. Unsurprisingly, the French and Portuguese regions offer a wide range of activities to practice in family. 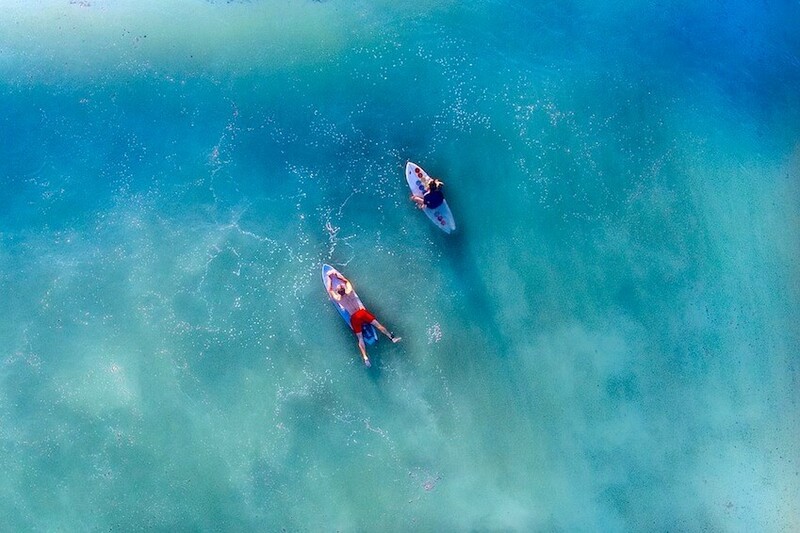 Both rich in nautical experiences, you can indulge in boat trips or kayak, jet ski, or surfing. 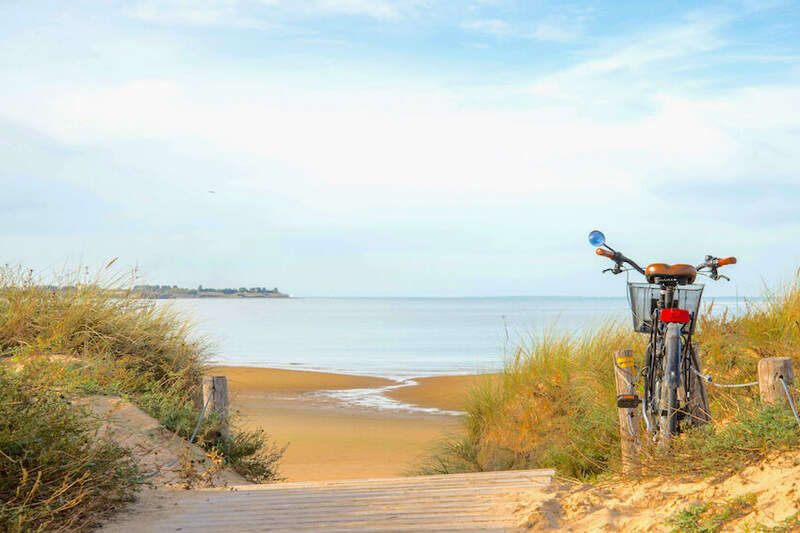 Promoting traditional values, the Ile de Ré has preserved for generations, know-how and local activities. Thus, when the tide is low, you can experience shore fishing, typical activity of the region. Venture with your family! The activity is accessible to the youngest and the oldest. Also, windy and exposed to the Atlantic swell, the region has the perfect climate to slide on the waves! You will not have trouble finding a sailing school to introduce or improve yourself. For the thrill-seekers, the region offers also kitesurfing. In the Algarve, you can embark on a boat and venture on a dolphin safari, to admire these friendly species in their natural environment, or to cross these fascinating caves growing from the sea. Famous for its golf courses, you can also go round the many courses in the region, to introduce you, improve, or simply to compete with your loved ones. Outside the coast, the natural areas of the two regions allow you to spend privileged moments such as a horseback ride, a bike ride, or wine tourism thanks to their acres of vitic domain. The two regions will transport you to sublime villas between modernity, tradition, and nature. On Île de Ré, you will find white houses perfectly integrated in nature. These are authentic and local properties that have been renovated and present touches of contemporary modernity. Sleep in a mill, stay in a house where vines grow on the facades, enjoy a contemporary architecture, or noble materials. They are ideal for enjoying the outdoors, thanks to the nature that surrounds them and the pools they have. In the Algarve, these are houses that are full of sights. The properties feature spacious swimming pools and majestic architecture with large columns reminiscent of the Portuguese style. They are a blend of traditional luxury and a touch of modernity. A contrast that will make you feel in a chic and refined environment, at the height of comfort. Some of them offer us only an exceptional panorama on the ocean, but also a direct access to the beach. In addition to their enchanting setting, you will find in some villas in our two regions a house staff who will take care of you and deliver a tailor-made service.